This article is about the limited 5★ Nero. For the 4★ , see Nero Claudius. For the limited 5★ , see Nero Claudius (Caster). Available during the Chocolate Lady's Commotion event. Deal sigificant damage to a single enemy. 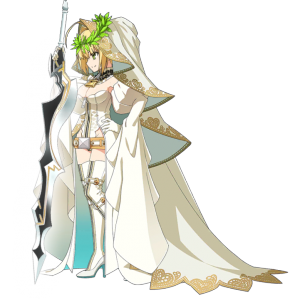 When equipped on Nero Claudius (Bride), Increase Arts Card performance of all allies by 15% while on the field. 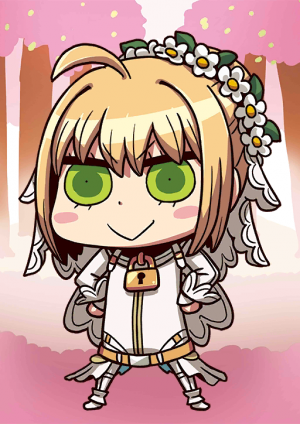 Putting on a new dress, the Emperor of Roses is clad in pure white. As her dress changes, her attitude changes as well, and even her battle style is different from her regular self. Her beloved sword, Aestus Estus, senses that, and changes its color from crimson to platinum. 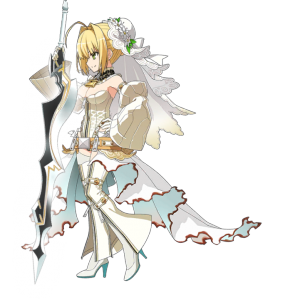 Umu, this is my long-awaited wedding dress! A curse inherited from when she was alive. Due to having chronic migraines, her success rate of skills dealing with mental status declines considerably. Nero is a (self-proclaimed) artist, but due to this skill, it is difficult for her to completely exhibit her talent. A special skill derived from Aestus Domus Aurea. 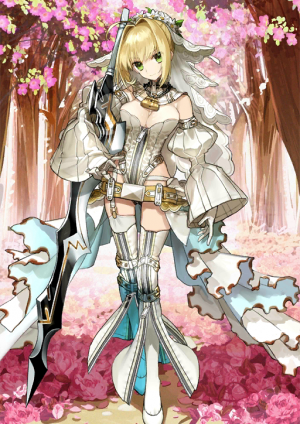 In reality, this is merely a sword-technique, but with the perfect marriage of flashiness, elegance, and the impact of the wedding dress, this should be a Noble Phantasm, right? Since she saw it that way, it came to be treated as a Noble Phantasm. In the Year 59 (some say 60), to pay homage to the Olympics held in Greece, she started the "Nero Fest," to be held once every five years. The competition held three divisions of music, horse-riding, gymnastics, and she participated in a number of those. In the Year 69, she was dethroned by the rebellion and fled from Rome. During her escape, she realized she couldn't get away and decided to end her life. Ascending to the throne at 17, she gained overwhelming popularity with the people for her generous politics. She's also well versed in foreign politics, and the popularity towards Rome in the England (Britannia) of later years was due to Nero's diplomacy. Persia also frequently praised Nero, and even after her death, they still showed respect towards Rome because it was Nero's country. 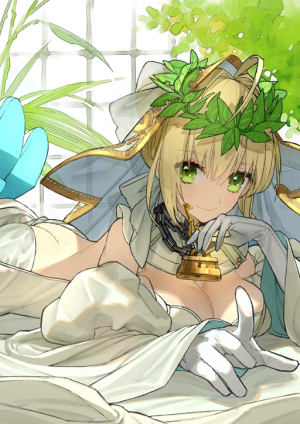 In her former life, Nero remained without a spouse until death, and even after becoming a Servant, she still hasn't encountered that special someone throughout all her battles. In other words, this is a form that's only in her dreams, a place where she did not join the Holy Grail War in a certain virtual world. With a whole new get-up, the emperor of roses wrapped herself in a pure white outfit. Due the exchange of outfit, her tension has also changed and her combat-styled underwent a variation from its original condition. Even her favorite sword - Aestus Estus - has read the mood and converted its blade from red to silvery snow. 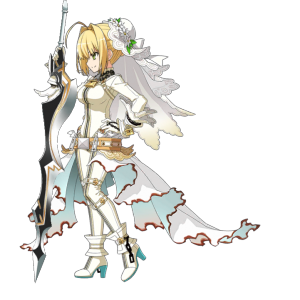 Umu, an ace in the hole wedding dress! In A.D 59 (some views say A.D. 60), following the example of the Greek Olympics, she established the quinquennial athletic meet "Nero Fest". Enthroned emperor at the age of 17 years old, Nero boasted tremendous popularity with the citizens due her generous political measures. She also paid attention to diplomacy, the popularity towards Roma in the England (Britannia) of later years had her political measures as its cause. It has been said that Persia would abundantly give high praises to Nero and, even after her death, there was a great concern in Roma about Persia "given it was Nero's country". A curse inherited from one's origins in life. Due having chronic headaches, the success rate of Skills with regards to mental aspects declines considerably. 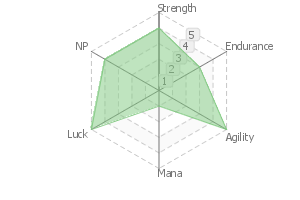 Nero was a (self-proclaimed) artist, but it is difficult to perfectly exhibit her full talents because of this Skill. An unique Skill that derives from "Aestus Domus Aurea". 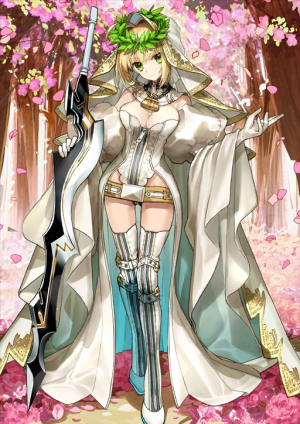 It is merely a sword-technique, but "from its gaudiness, loveliness and the overwhelming marriage-ness released by the wedding dress; why not call it a Noble Phantasm already? Right?" - it came to be treated as Noble Phantasm because of such statement from the person herself. 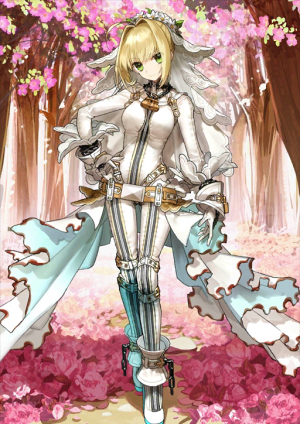 Nero Bride's gain 1 more hit counts after 19 April 2017 game updates. This page was last modified on 26 September 2018, at 23:18.